LEATHER SEATS!!! GORGEOUS!!! CERTIFIED PRE-OWNED WITH WARRANTY!!! AUX INPUT!!! SUPER CLEAN!!! CarFax has Certified a CLEAN TITLE!!! STUNNINGLY BEAUTIFUL 2014 Volkswagen Jetta SE!!! SERIOUSLY LOOKS LIKE NEW INSIDE AND OUT!!! Drives like a dream! Just buy and drive!! Open Hours: TUESDAY - SATURDAY 11-6. Come see our QUALITY CARS at VALUE PRICING and receive GREAT SERVICE!!!! Our LOCATION is at 126 W Business Park Dr, Draper, UT! ***WE'LL TAKE ANY TRADE-IN!!! *** ***EXTENDED SERVICE CONTRACTS AVAILABLE*** Options to fully extend the Power-train or Full Comprehensive Warranty are available! **Did you want a Rear Entertainment System/DVD Player!!?? Just Ask!! If this vehicle doesn't have one we can have a factory standard DVD Player with Wireless Headsets and Remote installed for only $999!! 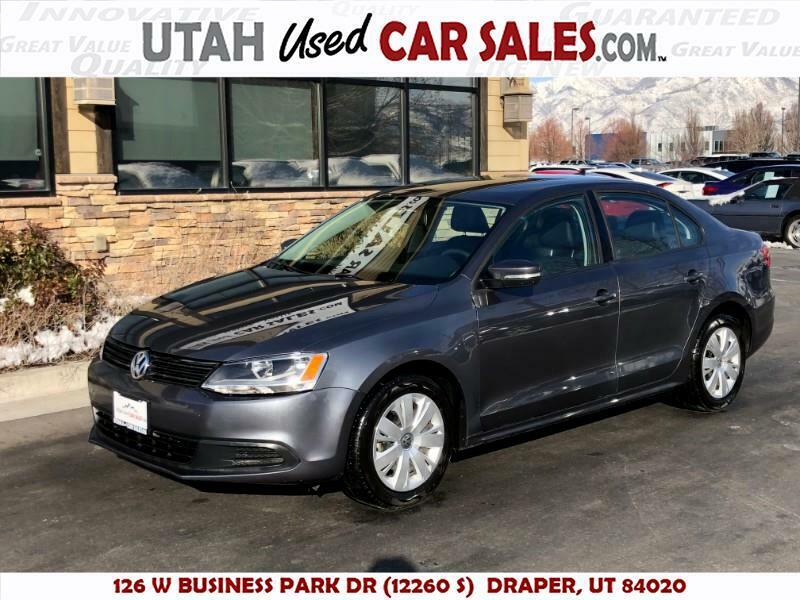 *** Visit Utah Used Car Sales online at www.UtahUsedCarSales.com to see more pictures and details of this vehicle or call us at 801-285-0459 today. UTAH USED CAR SALES in Murray, UT ***Here at Utah Used Car Sales we work hard to offer a great experience to every current and potential customer. We offer a full array of Extended Service Contracts, GAP coverage, and Financing. **Certain Terms and Conditions Apply for Financing and OAC** Please see dealer for further questions. All advertised pricing of our vehicles does require additional fee’s, taxes and licensing etc... Although Utah Used Car Sales strives to be mistake free, mistakes do happen. Utah Used Car Sales cannot and will not be held responsible for errors within our ads, please verify all claims before purchase.